For all practical purposes, on Sunday in Green Bay, the Saints had their playoff atmosphere for the year. It was entertaining at least, the litany of twists and turns that made it close. Hartley’s missed kick did not lose it for the Saints. Here, we contend it was lost in the third quarter. Down 21-14, the Saints had first and goal on the Green Bay one yard line. They proceeded to throw 3 straight passes. How cute. They only came away with a field goal. It’s first and goal on the one. Run the damn thing. How do 4 more points look now? To top it off, with 10 minutes remaining the Saints had the ball on their 10, up by 6. Another 3 straight passes, all incomplete, one tipped, fortunately not picked off. They had the ball all of 21 seconds and punted, whereby the Packers quickly drove for the winning score. The running game continues to be the best investment the Saints refuse to make. At this point, and particularly after some assists from the refs on Sunday, they deserve to be Ohfers. There were a few signs of relief. The offensive line protected, for the most part. Brees looked like himself, though pushed over the limit with 54 passes (and when you throw 54, some are going to get dropped). The defense was not as frequently out of position as it has been, even if it didn’t make a play, though Rodgers’ audible into a skinny post into a gaping hole in the Saints’ secondary in the red zone for his second touchdown pass was like taking candy from a baby. Patrick Robinson’s interception of Rodgers down the sideline was so picture perfect it looked alien in New Orleans. We all would like the see the 4 man pass rush that the Saints drone on with deleted from the screen as it hardly even breathes on opposing quarterbacks. It’s in slow motion. And so it goes. Over the years, has any team drafted consistently better than the San Diego Chargers? LaDainian Tomlinson. Junior Seau. Drew Brees. Philip Rivers. Antonio Gates. Darren Sproles. But (fortunately for the Saints) holding onto talent has been a slippery proposition in San Diego. Tomlinson was one game away from a Super Bowl with the Jets and Seau went to one in New England, before they were finished. Saints fans can’t really ridicule their front office for giving up on an injured Brees and going with Rivers, but we’re glad they did. The Saints would not have won 13 games last season, nor have nearly a potent an offense, without Darren Sproles. Former running back Michael Turner was seen busting a screen for 60 yards and a touchdown Sunday in Atlanta. Receiver Vincent Jackson did very little wrong on the field when he was there and is now doing spinning the same act in Tampa. Running back Mike Tolbert is now part of a two running back punch in Carolina. Ex-cornerback Antonio Cromartie now starts for the Jets, who gave him a $500,000 advance to help with child support after fathering nine children with eight women living in six states (say ‘dat again?). The only way Charger fans have been able to see all these players in crux compete for a Super Bowl is with joysticks, on the EA Madden video game. As good players have come and gone, the Chargers have perennially fought the underachiever label. The impatience spilled over to the head coach position when Marty Schottenheimer could not get the Bolts over the hump in the playoffs, despite bringing out the best in Tomlinson, and was fired after going 14-2 in a regular season. 14-2! Head coach Norv Turner wasn’t expected to be back this season after the team failed to make the playoffs last year despite being prohibitive favorites to win the division, but he is, and supposedly on the hot seat. He has the Bolts off to 3-1 this year; many of his previous teams have been compromised by slow starts with last season rallies that fell short. One dot com rating service had Turner in the top 10 worst coaches of all time in any sport, but we think that is pushing it. After all, on the field, he has had plenty of cards to shuffle. If Turner does eventually get the axe, general manager A.J. Smith should also be shown the door for letting too much talent leave the building. Salary cap spins feel like a broken record. And by all means, their scouts should be given lifetime contracts. His agent would tell you different, but Philip Rivers is not yet an elite quarterback, though can be a very good one, and one of these guys the stat and Fantasy freaks adore for his plethora of 4,000 yard passing seasons. But he won’t get marquee status unless the Bolts at least win an AFC Championship. Rivers has a prominent presence in the pocket and a slingshot for an arm, but is prone to bouts of carelessness for throwing into coverage for game changing interceptions. Last Halloween, in the waning moments of a critical overtime divisional loss to the Chiefs, he fumbled the snap. Though a fierce competitor, Rivers does not earn any brownie points when seen running his mouth on the sidelines to a tolerant Turner when something goes wrong. Regardless, he and his receivers, which now include former Saint Robert Meachem, will give New Orleans’ defense plenty of headaches on Sunday night in prime time. Louisiana Lightnings Rivers’ younger brother is a back-up QB at L.S.U. and physically resembles his elder. Fullback Jacob Hester, a former Tiger favorite, is no longer on the Bolts after dropping some balls last year, but safety Brandon Taylor made the team this season, as did Ladarius Green, a back-up tight end from U.L.L. – Lafayette. Many people may not realize it, but the largest L.S.U. alumni base outside the state of Louisiana is in – San Diego. They have a spring crayfish boil that has become a civic event. Heck, San Diego even has a Mardi Gras. Men Of The Hour With the Saints in playoff quicksand, Sunday Night Football has other meaning. Fans should cheer just for a touchdown pass as much as a win. 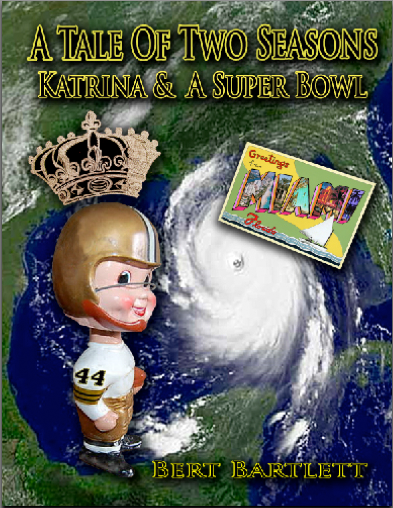 Brees will attempt to break The Great One, Johnny Unitas’ record for most consecutive touchdown passes in games, at 48. We feel this record is much more meaningful than passing Dan Marino for total yards in a season last fall, because it is a testament to #9’s model of consistency. After all, this is an equivalent of throwing for a TD in every game for 3 consecutive seasons. Not Bad! And furthermore, Brees is to be complimented for being in the same sentence with Unitas, whose name will always be at front and center of any talk about who the greatest quarterback in the modern era was. Ironically, Unitas concluded his career in – San Diego, so some divine interplay seems to be at work this weekend. It’s rumored that Sean Payton may get permission from the league via Brees to attend the game, for its historical significance, though still barred from communicating with the team. If so, the feeling in the Dome will be like a real live Elvis is in attendance, and plenty electric enough to match the Chargers’ helmet logo. Don’t put it past Saints fans to “borrow” a searchlight from the N.O.P.D. and scour the stadium for Coach, who is sorely missed. Bolt Emulation The Saints and Chargers don’t see each other very often, so they don’t have what you would call a rivalry. How can the Brees and Sproles factors bring on any natural animosity, not to mention where all those L.S.U. fans are? Last time they played during the regular season, the Saints bested them in London. But the Charger past has one fish in the sea the Saints would love to somehow reel in. San Diego was the only team in post-merger league history to start 0-4 and make the playoffs, in 1992. Good lord, you know some ****. It’s Antonio Cromartie, BTW… And isn’t Rivers’ backup, Jarrett Lee, the QB we watched getting clobbered by the Crimson Tide last year? I was sorry to see him not mentioned in your piece, but maybe there is a reason. You, after all, are the expert. Nice of you to send me a link to your latest post, B. Good to see you writing again, and so well. Good luck on Sunday. May the best team win! I should have gone with just Cromartie, but Souls Of The Saints regrets the error. I didn’t see Lee on the roster (?). You are part correct, the other LSU QB that got the worst of Bama’s defense was Norman Jefferson, especially in the BCS. Expert? You said that, not me. I only represent myself as a Saints fan. Best of luck to the Bolts the rest of the way. Neither conference has any world beaters.